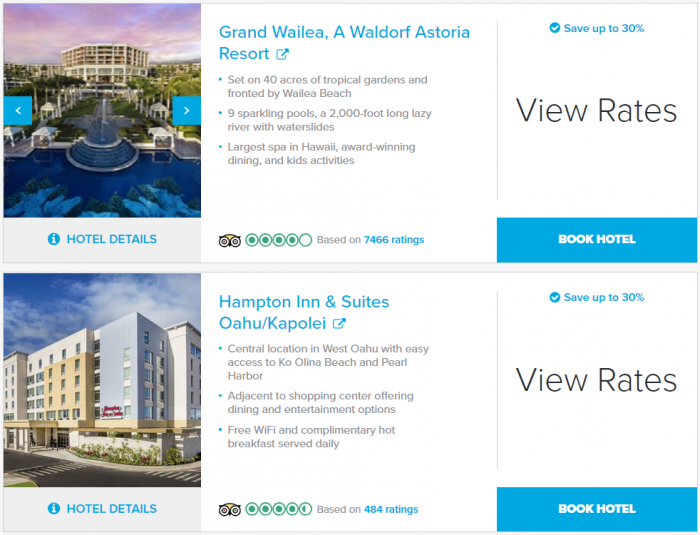 Hilton Honors like many other hotel chains and businesses offer special deals for residents that live in Hawaii in the form of Kama’aina-rates. Hilton Honors members that have either Hawaiian ID or driver’s license can get up to 30% off at participating hotels. Usually these rates are offered so that locals can also enjoy hotels and other establishments that otherwise may be cost prohibitive. Hilton Honors may have offered these rates previously but just put up the dedicated website to book them online. Remember that you need to have the proper ID! Offer is subject to availability at participating Hawaii hotels & resorts within the Hilton Portfolio, offer details stated herein, and the selected hotel’s booking terms and conditions. Valid for Hawaii residents only. Must present valid Hawaii ID at check-in. Offer includes exclusive discount to Hawaii residents of up to 30% off of the hotel’s best available rate. The actual discount rate relates to the hotel’s Best Available Rate (“BAR”), which is a specific rate type that varies depending on time of purchase, is unrestricted, non-qualified and excludes discount rates. Proof of residency is required upon check-in in the form of a valid Hawaii State Driver’s License or Hawaii State ID with a Hawaii address. If valid proof of state residency cannot be provided at time of check-in, hotel reserves the right to modify reservation to reflect current Flexible or Best Available Rate. This offer may not be combined with other select promotions, offers or discounts and is not valid for groups or existing reservations. Blackout dates, early departure fees, and deposit and cancellation restrictions may apply and vary by hotel. Rates will vary based on individual hotels and specific travel dates selected. Unless otherwise stated, quoted rates are per room per night, based on single/double occupancy and do not include taxes, gratuities, incidental charges and resort fees (if applicable). Participating hotels are subject to change without notice.